Written by: Rhett Reese and Paul Wernick. They say there are no original ideas in the movies anymore. The stories are borrowed from one source or another. Life doesn’t just borrow an idea, it virtually kidnaps the plot for Alien. If you saw the trailer and thought that it looked familiar, it is. This is a film that offers no new twists or tries to reinvent the genre, it just blatantly steals from one of the greatest sci-fi horrors ever and doesn’t seem to make no bones about it either. The International Space Station has been on a mission to collect specimens from Mars. On investigating the soil samples, they discover a small creature, proving that there is, indeed, life on the red planet. The creature starts to grow and take shape but when they think it has slipped into a coma due to lack of oxygen, it awakens and escapes the confines of the lab, turning the station into a hunting ground for the creature. This has had a great deal of money thrown at it and it does look very handsome, starting with an impressive single-shot sequence as we watch the crew going about their everyday routines. It immediately gives you the same feeling that Gravity did. Within minutes afterwards, however, the film becomes as familiar as leftovers from a meal the night before. The creature, a continuously growing cell that looks like some vicious clear goldfish, starts hunting down the crew al la Alien, The Thing, Event Horizon and a whole multitude of Alien rip-offs. While most other movies you could forgive this, with their B-list cast and a director may be starting out and from a studio that doesn’t have the same pulling power as some, this comes from Columbia Pictures, has an impressive A-List cast of names and the director of Safe House and Child 44. It also looks like a film with buckets of money thrown at it, from the design to the effects that are all up to the standard of a big blockbuster movie. Surely someone must have said at some point: isn’t this Alien? It is Alien! From the small cast floating around in space to the use of flame-throwing devices to a creature that manages to look like a less threatening…alien! It zips along at a great pace and it never once becomes baggy or outstays its welcome, it just lacks anything that is unusual or different. The sketchy characters, all with nothing interesting or dark about them, are picked off one by one in gruesome fashion are they try to control or destroy their unwelcome guest, with the threat of it ever reaching Earth. The cast, on first impressions, is nothing short of impressive. Jake Gyllenhaal, Rebecca Ferguson from Mission: Impossible and Deadpool himself, Ryan Reynolds. Those names alone should make you think this is a must-see. Instead, they are given nothing to do but look scared and out of breath as they float around the space station, trying to find the creature that is trying to kill them. You do wonder if any of them actually read the script before signing up because they don’t have to stretch themselves whatsoever. To say that Life is a disappointment is a massive understatement. It is lazy, uninspiring filmmaking that should have on the credits “any similarities to Alien and other sci-fi horrors is purely done on purpose!” On the day in which I saw this and Power Rangers, the latter turned out to be a far more entertaining affair. 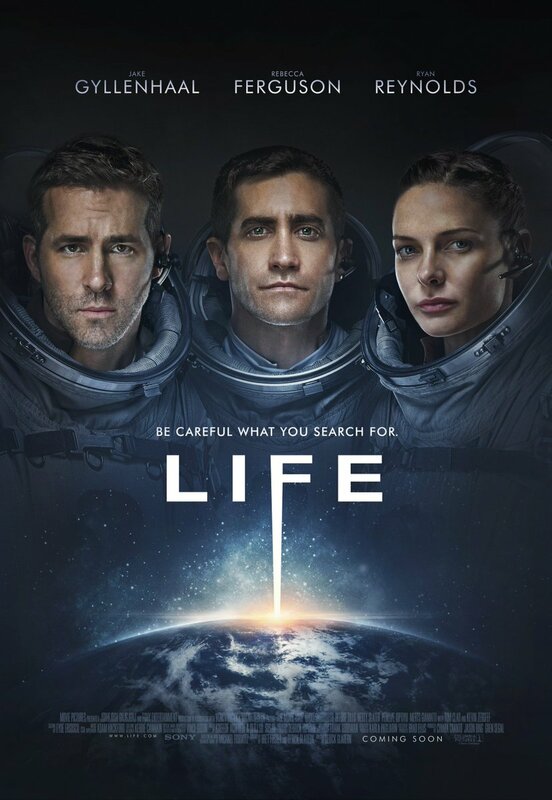 A waste of talent and it makes you yearn for Ridley Scott’s classic.